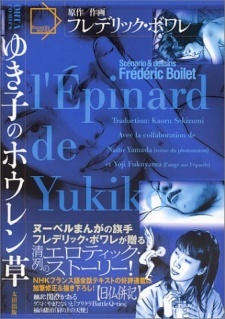 The first Nouvelle Manga ever produced, this is an autobiographical account detailing French artist Boilet's infatuation, courtship, affair and break-up with the eponymous Yukiko - a young Japanese woman who never attempts to disguise the fact that, whilst she might love Boilet, he is not the man she ultimately wants to be with. Yukiko not only becomes Boilet's lover but also his model and she thus becomes intimately entwined with his art. When she leaves him, he finds himself in need of a new muse - a story which is begun here and continued in the follow-up work, Mariko Parade. Yukiko no Hourensou was published in Japanese by Oota Shuppan (太田出版) on August 21, 2001, in French as L'Épinard de Yukiko by ego comme X in September 2001, and in English as Yukiko's Spinach by Ponent Mon/Fanfare on July 1, 2007. No characters for this manga have been added to this title. Help improve our database by adding characters for this manga here. No discussion topic was found.